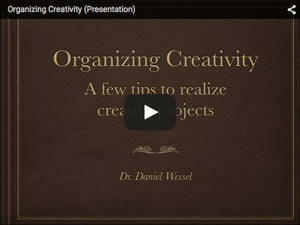 How to generate, capture, and collect ideas to realize creative projects. A graphic novel about an artist who wants what every artist wants, not being forgotten, and the last 201 days of his life. Beautifully told. Ah, Internet. It allows you access to the world of creeps without having to smell them (to quote someone I have just forgotten), but it also allows you to watch masters at work. Here's a video of a great artist just ... warming up. The audio is terrible but Hadley Wickham's presentation gives a very good introduction into R — and why it's better than using a GUI based software like SPSS or Excel. You can easily combine a projector and a blackboard. A short comment an an issue when it comes to communicating ideas and giving feedback. Guessing playing with my weight is the second favorite game you can play with yourself. It's fun to (possibly) detect pattern. If you are interested in leather, medieval stuff, and LARP — and you are living in Germany, "lederkram.de" might be something for you. Students in interdisciplinary subjects can sometimes feel like ducks — they can do everything, but nothing well. Well, they are underestimating ducks. Always nice to find a good TEDtalk. R is still really, really cool. Esp. if you start to write functions for yourself and create your own package. The amount of annotation you can provide is cool and makes you wonder — why doesn't statistic software usually provide this? 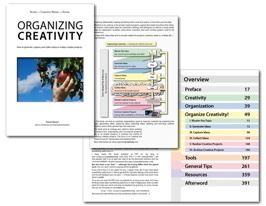 Besides Blog Postings about multiple topics, the second edition of “Organizing Creativity” is freely available as PDF here. A comment for those seeking to use this site for personal gain: Given the increase in requests, let me be clear. I write on this blog because I want to. It’s my hobby, my playground. Sometimes people point me to interesting products/services and I write about them. But any request regarding ads or sponsored placements ends up the trash without a reply. And if you think something would be of interest, differentiate yourself from the spammers by referring to a posting. Thanks. This blog is not focused on a single topic, or method. As long as it is relevant to improving creativity (or allowing it in the first place), it's fair game. The heterogeneity of the postings can make reading this blog a bit cumbersome, at least if you are only interested in one topic. You can either use the search function (above), or use the categories or the tags to narrow down the postings you see. Ronny Herbst on What makes a good outliner?